Liz Hawkes deNiord's "Return As Ticket" exhibition of paintings and ceramics, currently showing at C.X. 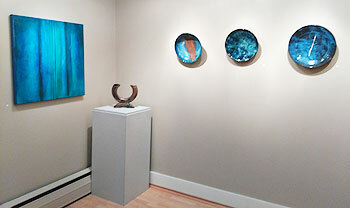 Silver Gallery (814 Western Ave., West Brattleboro), features a recently launched book of the same name. The book can be previewed and purchased at the Gallery through March 2018 or online at magcloud.com/browse/issue/1331705. Hawkes deNiord's recent paintings record the distillation of memory, dream, allegory, and emotion into impressions using paint and mixed media. Her large abstract works represent a "reflective response to world events and personal reflections; they present a visual interpretation through vivid color." A resident of Westminster West, Hawkes deNiord majored in fine arts and Asian studies in college and graduate school, developing her painting style originally in oils. 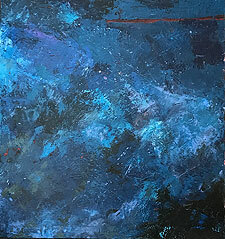 She now works with viscous acrylics and metals. Her additional training as a ceramicist and printmaker brought her to "different ways of thinking" as a painter. The most difficult and exciting part of the experience, she says, is paying attention to the inherent message developed in each work. 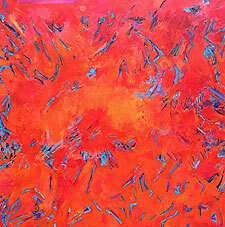 "Abstraction allows for fluid expression of an idea by both pulling away from and immersing myself in it. The paintings are painted inside out, as if I am actually in them. Standing outside looking in is a gut experience that challenges, confuses, and is a state of unknowing." · Open during Gallery Walk on Nov. 3, 4:30-6:30 p.m.
· Gallery open daily by appointment, through March 2018; call (603) 209-7386 or (802) 257-7898.